*A protocol clarification for when walking a dog (not addressed in the video): Your safest option always is flat-out, absolute AVOIDANCE: Whether you see a coyote in the distance, approaching you, or at close range, leash your dog and walk away from it, thus minimizing any potential dog/coyote confrontation or engagement. If you choose to shoo it away, follow the guidelines in the videos, but know that what’s safest is proactive, preventative unmitigated avoidance: i.e., walk away. 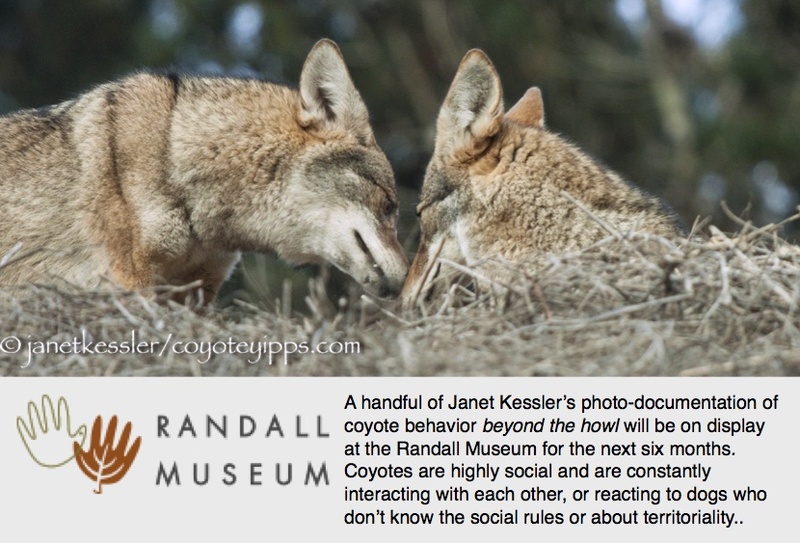 Coyote Coexistence & Behavior — an update of what to expect & what to do, especially if you have a dog. Pupping Season: What Behaviors to Expect If You Have A Dog and What You Can Do. Pupping Season: “Scary” Does Not Translate Into “Dangerous”, But Heed The Message! For more information on dogs and coyotes, type DOG or DOGS (plural) into the “search” box at the top right of the blog to bring up many dog/coyote related postings with a lot of information to increase understanding of dogs and coyotes. I don’t know why using plural brings up different articles, but it does! “Don’t Haze, AVOID”: How To Handle A Coyote Encounter: A Primer (text version); or printable flyer version as seen below. CoyoteCoexistence.com for additional coexistence information. Take a SHORT “Coyote Experiences and Opinion” Survey! Hi Rita — Thanks for your message, and thanks for defending the wild animals. I know it can be very discouraging when people don’t care or won’t listen. Never give up, because your message is being heard on some level by everyone. Sometimes it takes repetition and saying by many people before it sticks. Keep up the good work! Hi…………….i will put you link on my Coyotes, Wolves and Cougars Forever blog site………….would you consider reciprocating? Great job on your site!!! I loved all the pictures, especially the coyote in the tree. They are beautiful. I’m an outdoor person, film all kinds of wild animals, lived in remote Northern Michigan most of my life, and rarely see coyotes. I hear them all the time, and their tracks appear in my forest every winter night, but they have such an amazing ability to exist unseen, it’s incredible. I never thought I’d have to go to the city to have a better chance of seeing coyotes! My daughter sent me a news story from Chicago where they intentionally released a few dozen coyotes there to address the feral animal problem. Really nice stuff on coyotes. Thank you. Thank you for your comment. I’m glad you like the photos, especially those of coyotes in trees! Who would have thought this — coyotes in trees! Your own remote part of the world sounds very exciting to me — the wildlife. In a city, people tend not to think of the wildlife at all, yet wildlife is here and it is impacted tremendously by constant human intrusion and management. For example, native plant programs in our parks involve clearing out their habitat and the use of poisonous pesticides. Chicago, incredibly, has about 2000 coyotes — they are being studied there. However, even in cities, the same as in your forest, coyotes have that amazing ability to remain unseen. Most people, still, are surprised to hear that there are coyotes in their own city, and even of those who know about them, few have actually seen them. But the number of people who have seen them does seem to be growing a little. As you can see from the blog, coyotes are fascinating — and they need us to root for them to offset the negative and often sensationalist stories that continue to pop up! Again, thanks! Your blog is fascinating!!! I love all wildlife and see coyote often in portola valley. We have a 14 acre organic orchard that butts up to open space. Lots of coyotes come on our property to eat fruit and also use it as a corridor. This year there is a bold little guy who seems to be on his own. Tonight I took my dog out for a quick spin around the orchard off leash a bit later than normal (I could barely see). I was making a lot of noise on purpose with my feet to give notice to any coyote or mt lion who might be around. I was astonished to stumble upon the little coyote. He obviously heard us coming, but didn’t run. At first my dog sort of scolded him with a woof and little lunge, but she stayed with me. That prompted the coyote to run about 50 feet away, where he just sat there watching us. I was so surprised he didn’t run for cover in the thickets. I actually thought I had imagined the whole thing, so I turned on my flashlight to see if the vague form I could barely make out was really an animal. That triggered coyote to run for the thicket. My dog did give chase, but I called her off right away. After that we stood still for a while and I could hear coyote rustling right at the edge of the thicket, surely watching us. I immediately came inside to google coyote behavior and found your blog. I am learning a lot from you. Thank you!!!!! I love coyotes and all things wild, so I will absorb your messages with a big heart. Thank you for responding Janet! Okay, I will continue to tell you my coyote stories and send you photos. This is so exciting! I blew off my commitment tonight because I can’t stop reading your blog! It’s so much more interesting and real than a textbook! I see a family of three coyotes at Mussel Rock Beach. The mother is the one that seems to be an ‘alpha’ as she does not scare off as does the papa and baby boy. She does this thing with my dog where she approaches her from behind and nips at her, my dog will then turn and she runs and my dog attempts to go after her thinking they are going to play. When the coyote keeps going, my dog comes back and she then chases her. This went on for about 3 or 4 back and forth chasing, and then I just put my dog on leash and kept going and she left. I witnessed 3 coyotes chasing this other woman’s dog in somewhat of a half circle. It appeared as if they were trying to get her dog to go off to the brush where they live, but the dog was smart and ran toward the beach. Another instance was with a husky. I spoke to the girl who owns the dog and she felt they were trying to get her to chase them into their den or territory so they could all attack her for food. I know of two small dogs that disppeared in the brush because of the coyotes, but I didn’t think a large dog would be prey as well. There are a lot of feral rabbits so food is plenty for them. Mussel Rock had a lot of feral cats some 10+ years ago and I would help feed them every now and then. The cat population is not what it use to be now. Only a few maybe 5 or so are left. I am able to take pictures of the 3 coyotes, but they do keep their distance or turn and go into the bush. I also go up to San Bruno Mountain during the winter time when tick season is dormant. There are 3 coyotes up there as well. I love your video and am glad to hear they mate for life and remain a family as well. I was so sure that MaMa and her baby (a male) were going to stay together, but when I saw another coyote with them, I assumed it was PaPa. They are very interesting, and I do not fear them at all. I just fear they could lure my dogs to their den or territory, so I keep close tabs on them. Thank you for sharing this amazing site. How should I co-exist with the coyote that jumped over my fence last year? The coyote attacked my 20 pound dog, picked her up by the scruff of the neck and tried to carry her away back towards my fence. The coyote only dropped my dog when I ran outside, made loud noises and ran after it. If I hadn’t done so, my dog clearly would have been dead just like the one killed down the street about two months ago here in Daly City This coyote was a predator who invaded my property for a meal and not an animal I wish to co-exist with. Your apologist blog appears to always blame every creature except the coyotes when these attacks happen. You never seem to acknowledge that these coyotes are also super-predators whom sometime need to be stopped with whatever means possible. Thanks for writing. I’m glad you were able to save your dog — I can understand why it was so upsetting. Please know that coyotes are opportunists, and they don’t know that fences are OUR means of keeping things out of OUR yards. They use urine to delineate their territories, not fences. YOU have the capacity to protect your pet by not leaving it out unsupervised. So be out there in the yard when your pet is out there. Human built fences are mostly to keep other humans out. I can guarantee that other critters visit your yard too, be they rodents, squirrels or raccoons, or be they song-birds, hawks or owls. A very small dog can also be picked up by an owl. A raccoon can kill a dog. Only you can protect your pet from any of these things — it’s not that hard to do.